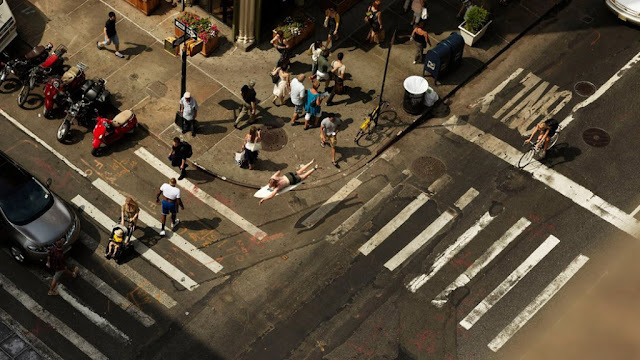 I think I can safely say many people living in Manhatten are in someway or another waiting for their big break, but this is not the type of 'break' the talented photographer Romain Laurent was thinking about when he created his latest series L'horizon. Surfing in the big apple is certainly a pretty wacky concept and his series of photographs would leave most viewers wondering 'how was this possible? ', well with a splash of the correct lighting, depth of field and some clever eye trickery he has created something which is overwhelmingly different. As the surreal theme runs through his work, he seems to be increasingly closing the gap between photographer and artist, with some of his work looking like it was created by a modern day Salvador Dali. As our world develops digitally, thus enabling artists and photographers to push boundaries they would never have been able to touch 100 years ago, Romain Laurent is certainly embracing our ever growing digital age and producing some truly breath-taking images. He is definitely worth regular stalking. these pictures are awesome, I esp love the one looking at all the tall buildings. makes me miss nyc! Oh my gosh these are cool pictures!! Awesome photographer - how on earth did he do that? !